"Vocalise" is a song by Sergei Rachmaninoff, composed and published in 1915 as the last of his 14 Songs or 14 Romances, Op. 34. Written for high voice (soprano or tenor) with piano accompaniment, it contains no words, but is sung using any one vowel of the singer's choosing. This recording is exemplified on the violin and piano. The violin cannot produce any words, and therefore performs this work very well. There are emotions of loneliness, sadness, and confusion, but despite these intense feelings, the piece maintains a meditative overarching character. It starts with the piano playing a repetitive vamp, and the violin enters with a lonely but distinctive voice. The voice of the violin paints the image of the voice in a grave yard. 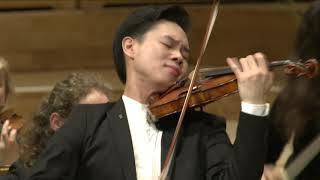 As the piece develops the violin changes its facade, and becomes intensely emotional with flavors of sorrow, crying and mourning before resolving in a ghostly voice at the end. With thanks to St. George's Anglican Church in Montreal, Canada. 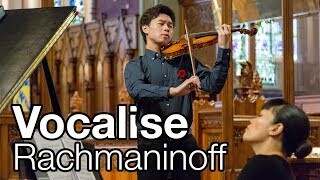 Timothy Chooi plays Niccolo Paganini: Caprice Op.1 No.24 at Studio 12, Maison de Radio-Canada in Montréal, Québec. 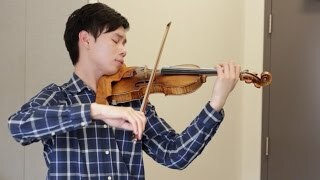 While training at the National Arts Centre's Summer Music Institute, Timothy Chooi (age 20) took some time to speak about his relationship with his violin, a 1729 Guarneri del Gesù on loan from the Canada Council Instrument Bank. 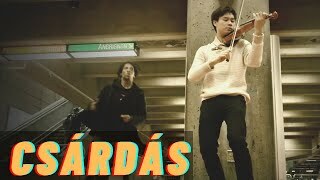 Quant il était de passage au Centre national des Arts dans le cadre de l’Institut estival de musique, Timothy Chooi (20 ans) a parlé avec nous de l’attachement qu’il voue à son violon, un Guarneri del Gesù de 1729 qui lui a été prêté par la Banque d’instruments du Conseil des arts du Canada.